By 1920 the International 12 Foot Dinghy had become the most numerous One-Design class worldwide with over 200 boats in the United Kingdom and a large number elsewhere. The class was given further boosts when it was selected for the 1920 Olympic games in Belgium and again in 1928 when it was used as the single-handed boat for the games held in The Netherlands. In subsequent Games its place as Olympic single-hander was taken by the Olympic Monotype (Olympia-Jolle), Firefly and Finn dinghies. 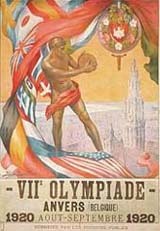 The 1920 Games were awarded to Antwerp to honour the suffering that had been inflicted on the Belgian people during the war. The Opening Ceremony was notable for the introduction of the Olympic flag and the presentation of the Athletes’ Oath. The Games ended in bankruptcy and the organising committee was disbanded. The Games' Official Report was published 37 years later in 1957, and does not contain much information about the sailing events. The 1920 12-foot dinghy sailing regatta was the only event in Olympic history to be held in two countries. The first race was staged in Antwerp, but my mutual agreement the last two races took place in the Netherlands because the only entrants where both Dutch! The gold medal was won by Johannes & Franciscus Hin sailing Beatrijs, and the silver medal winners were Arnoud van der Biesen and Petrus Beukers sailng Boreas. It appears that the Hin brothers won all three races.